Stock photo of the Toronto City Skyline at dusk as seen across Lake Ontario from Centre Island in the Toronto Islands in Ontario, Canada. 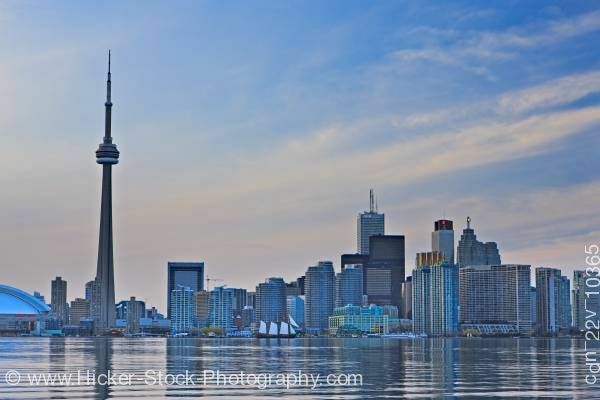 This stock photo shows the Toronto skyline, Lake Ontario, and the sky above at dusk all captured in shades of gray, blue, and white. This photo is taken from on Centre Island across Lake Ontario, in the Toronto Islands in Ontario, Canada. The CN Tower standa next to an arena on the left side of the picture and all the buildings appear lit in blue with just a their shadows reflecting on the still waters of the lake. Even the sky looks gray, white, and blue, hazy at gray the bottom and powder blue with streaks of white cloud above.